One of the biggest problems of a beginning pot smoker is how to roll a joint. To make things easier, I created a new tutorial with actual photos of all stages of the rolling process. 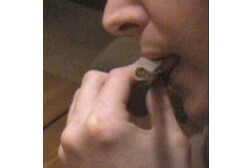 Joints have been popular for as long as anyone can remember. The history of marijuana shows joints are the #1 choice of smoking your herbs. It is time you have learned how to roll the perfect joint. Hit your best glass bong and enjoy the guide! Big sized rolling paper (about 5cm by 11cm). I usually use “King Size Smoking” manufactured by Miquely Costas & Miquel S.A., Spain. 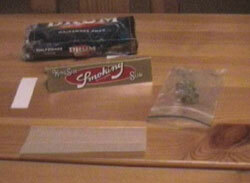 For small one person joints you can also use regular size rolling paper (Rizla, Mascotte, Drum). You can find rolling papers in a good headshop. A piece of thick (writing) paper or thin cardboard, size about 2cm by 6cm (here in Holland we call it a “tip”). This is used as a mouthpiece. It gives you something to hold on. No more burned fingers or lips while trying to inhale the last of the joint! Don’t use the filter of a normal cigarette, as they tend to filter out too much THC. Flowers/hash, as much as you like; 0.5 gram of good Dutch weed is more than enough to get 2-4 people very stoned. It depends on the quality of the stuff. Experiment to find the right amount. Step #1: You need the small piece of paper to use as a mouthpiece. Roll it up tight into the form of a cylinder. Step #2: Carefully heat the tip with a lighter, so that it won’t unroll. 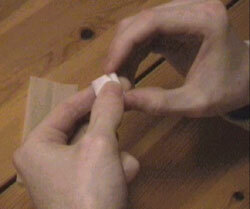 Step #3: Take the rolling paper with the “glue” side on top, away from you. 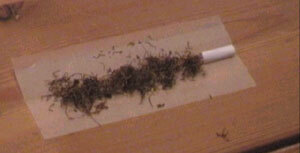 Put the first layer of tobacco on the rolling paper. I use tobacco because the superb dutch cannabis is simply too strong to be smoked pure. And I like the taste more. If you don’t like it, don’t use it, and use more buds instead. Here in the Netherlands, almost everyone smokes with tobacco. I always use good hand-rolling tobacco. Tobacco from filter cigarettes is too dry and tastes like crap. Step #4: Break up the weed, remove any seeds, stems and leaves. Crumble it well. Then spread the weed over the tobacco. Spread it evenly. Then add a second layer of tobacco. This is to improve the mix of the joint. A good mix makes the joint burn nice and evenly. Step #5: Take up the joint and hold it with your thumb, index and middle finger. Use your index fingers to spread the weed and tobacco evenly over the paper. Support the paper with your thumbs and middle fingers. Step #6, #7, #8: Then start rolling. Start in the middle, rolling outwards. Let your thumbs do most of the work and give support and pressure with your forefingers. Keep rolling, until you start to feel the mix firming inside the paper. Don’t worry if some stuff falls out; you can put it back in later. Keep rolling until the shape is right. Step #9: When you have an even consistency and the shape is right, tuck down the facing paper edge with the tips of your thumbs and tuck it in. Step #10, #11, #12, #13: Wrap the excess paper around the joint. The trick is to wrap it as tightly as possible, so you get a firm joint. Don’t worry if you don’t do it right the first time, just keep trying until you get it right. Then wrap the paper around the joint (Steps 10, and 11), wet the glue (Step 12) and seal that baby (Step 13). Step #14: If your joint is a little bit loosely rolled, you can use a pencil of other thin object to compress the weed and tobacco. Step #15: Then twist the end of the joint so that nothing falls out (picture 16) and trim the joint nicely. 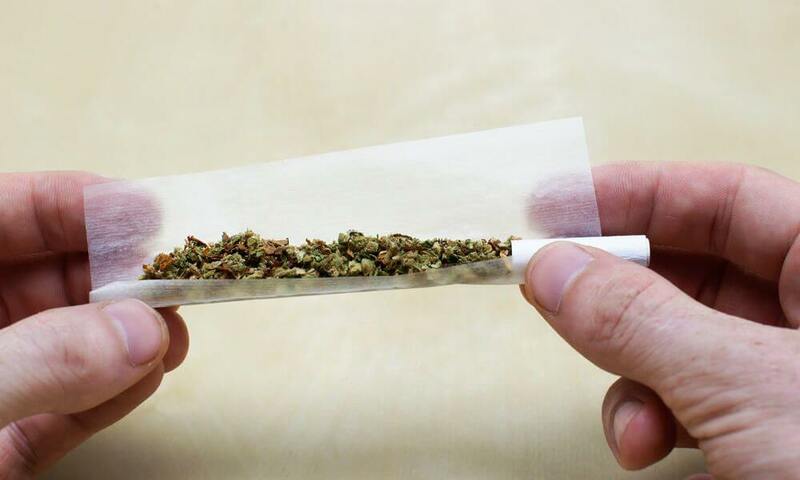 All joints should be: slightly cone shaped with the tip rolled tightly in the rolling paper. The best joints are firm but not so tight you have to burst a lung drawing smoke. Loose joints taste rough, burn too fast and have a nasty habit of setting light to clothing and furniture. Now light it up and have fun! I am one to spark a joint every night. It makes my thoughts more vivid and allows me to get closer with god. I am all for the decriminalization of cannabis, but please do not be stupid and drive around while smoking a joint. You are inviting your own problems. One of the biggest problem with cannabis legalization is regulation. We need to have laws protecting underage access to and usage of cannabis. We also need to deter and prevent drivers driving under the influence of cannabis. I used to smoke cannabis for many years when I was younger. I smoked phat joints and mostly ripped bongs because it got me far more intoxicated than anything else. All forms of cannabis consumption produce a different feeling and at different intensities. Experiment with the many available types of consumption like vaping, or cooking pot brownies. However, I agree that glass bongs are the best for smoking cannabis. I have ADHD and have been dealing with it my whole life. When in high school a friend told me Cannabis may help my ADHD. So I decided to hit the joint and to my surprise I was instantly calm and relaxed, I just wanted to chill for once, and this is rare for me. Now I smoke a joint everyday before classes and im never hyper. Cannabis is known to cause and to some relieve ADHD symptoms. Suffering from ADHD myself I also medicate to keep my ADHD under control. However, I have found if you smoke too much and your too intoxicated then your ADHD symptoms will increase. This is a major problem especially if your trying to get some work done. Keep micro-dosing in mind. Marijuana has some of the same cancer-causing substances as tobacco such as tar in the smoke. One joint is not as bad as a cigarette, of course not, but inhaling any smoke is generally not healthy at all. You sound like you need to smoke a joint to calm the phuck down. No need to be so blunt. Everyone is welcome to their own opinion and views on cannabis and legalization. At some level I do agree with him and his point is accurate, but @cleonard may not be aware of the numerous healthy ways of ingesting cannabis. Smoking any plant matter, tobacco or cannabis, will always contain unhealthy tar and impurities due to the way combustion works. However, a joint is best for special occasions and when you are really in need of relaxation. Something about the rolling process and social group atmosphere really makes a join an experience. I have insomnia really bad and I have to take sleeping pills to sleep. It's either smoking a joint before bed or taking sleeping pills for the rest of my life. I will choose the joint any day. Yes of course so would I. I have had backpain my entire life from bad posture while working at the computer all day. Cannabis provides the best pain relief compared to any other medicine available and has no addicting properties. I would always choose a natural plant over pharmaceuticals, and hope you would as well.